The big dry continues over much of New Zealand. Unlike our farming cousins there is minimal impact from the lack of water on established forests, other than increased fire prevention vigilance. The new year has continued with strong harvesting volumes and firm markets. Demand for logs remains strong across most regions of New Zealand. At-wharf-gate prices for Radiata pine in New Zealand rose again in March. Export log prices have risen steadily since April of last year when A grade was $86/JAS m³ (average indicative price all NZ ports). At $113/JAS m³ this month, the market is considerably stronger, but the outlook remains mixed. The rebound of growth in China has been more pronounced than most expected, and log stocks are still relatively low considering the recent Chinese New Year holiday period. However, CFR prices for NZ Radiata are now getting up to the level which has previously stimulated increased supply from North America (principally lumber from Canada and logs from Northern USA). Market observers are expecting this response to be more muted this time as lumber demand and prices are rising strongly in the USA on the back of resurgence in the USA property market. If this is the case, then NZ Radiata logs should be able to hold onto these prices and not suffer loss in demand. There will be a few months of expected high demand for logs prior to the onset of the hot season when demand tapers off. This can (although not always) result in a softening of the market during our winter months. The other headwind for New Zealand forest product exporters is the high NZ$/US$ cross-rate. This has come down from its peak of just over 0.85 in mid February to be trading around mid 0.82 in early March. However, in a recent BNZ briefing, clients were advised that it is likely the rate could reach 0.88 later in the year on the back of the NZ economy looking relatively strong (the key word is relatively) compared with others such as the Euro-zone and the United Kingdom. Further out a trend back down to "fair-value", considered to be in the low 0.70s, was expected (although such a prediction has been around for many years now). 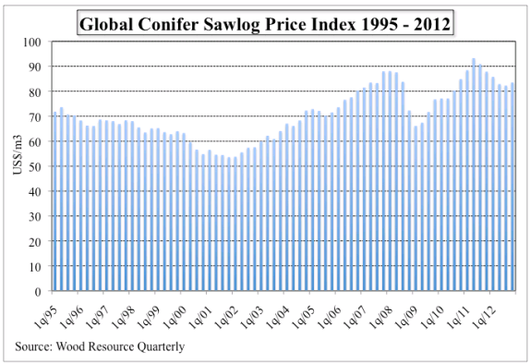 In contrast to export log prices in New Zealand steadily rising from April 2012 to March 2013, the Global Sawlog Price Index (GSPI - as reported by Wood Resources Quarterly) declined steadily from an all time high in the second quarter of 2011 to a trough in the third quarter of 2012. It broke this down trend by rising in the fourth quarter of 2012 (see chart below). So why would the GSPI be declining for half of last year when NZ export log prices were rising? Firstly the Index is expressed in US$ so exchange rate relativities can influence comparisons. However, the driver of the reduction in the Index was significant softness in major lumber markets such as the USA and Euro-zone in the aftermath of the global financial crisis. New Zealand's major driver of export log prices is China which has achieved its "soft economic landing" and maintained relatively strong demand for wood products through this period. However, the last quarter of 2012 has seen strong price increases in lumber across most major global lumber markets and price increases are expected to continue. Global pulp wood fibre prices, on the other hand, continue their downward trend based on lower demand for pulp and paper with weak global growth. More recently, increased lumber production has increased the supply of sawmill chip, an important source of pulp wood fibre. This has further weakened the market. This is hitting both softwood and hardwood chip exporters (e.g. Australian producers) hard. The global demand, supply and price of wood pellets continue to grow strongly. Big growth in supply is coming from the US South and British Columbia. Big growth in demand is coming from Europe and Asia as economies seek to install environmentally responsible power generation capacity with nuclear power largely off the agenda after the Fukishima nuclear accident. Log exports to Korea and Japan are steady at an annualised rate of approximately 1.5-2.0m m³ to each market. Indian log exports are continuing at low levels but are struggling to meet the returns from other markets. The upturn in the New Zealand housing market is gaining momentum, lead by Auckland. Compared to the lows in 2009, house prices are up 27%, 23% and 11% respectively in Auckland, Christchurch and Wellington. In nominal terms, house prices are also well ahead of their all-time peak in 2007. Auckland is 12% above its 2007 peak; Christchurch is 9% above and Wellington is the same. The housing market correction, which was prolonged and deep in the USA (prices some 30% off peaks), was much less severe and shorter in New Zealand. Consequently, NZ's love affair with housing appears to be back in vogue and will provide a welcome boost to economic activity but an unwelcome return of reducing housing affordability and diversion of scarce investment capital. The housing market upturn is also being boosted by net migration flows now turning positive for the first time in years. Increased domestic demand for structural logs and other wood products is being felt as a result of the Christchurch rebuild and strengthening Auckland construction market, although lumber and log prices and volumes are relatively static at present. A demand-side increase is expected to develop as the year progresses although perhaps with subdued Australian market and strengthening NZ$/AU$ cross rate, lumber previously exported to Australia may look for a home in the New Zealand market. The USA is looking more attractive to lumber exporters with higher in-market prices and increasing demand. This is mainly a pruned and quality log/lumber story. Lower grade logs/lumber and fall-down lumber grades are struggling with Asian lumber prices not keeping up with increased costs and the strengthening NZ$ having a disproportionately greater impact on value-added product prices (as compared to logs). Domestic log prices were, on average, unchanged. Export prices were, on average, up $3/JAS m³.